Haven’t read THE GRIMM LEGACY yet? Interested in winning a free ebook copy? 1) List your name. I’d like to put the name of the winner on my website. Do you really want to be known as superflysprinkles@glitterbug.stuff.net? I’ll keep your email address off the website as long as you give me your real name. 2) What’s your favorite fairy tale? It can be anything…from Grimm’s Fairy Tales, Hans Christian Andersen, Charles Perrault…or from any other multicultural folk tale that tweaks your fancy. 3) Is there a reason why you like that fairy tale? And it’s okay just to say…because I like it. If that’s the reason. Because that’s true of television shows, movies, books, etc…you might not be able to put your finger on it. If you know why, don’t cheat…let me know! 5) send that email to me at addiejking AT gmail.com a before midnight July 31, 2012. Notice I took out the @ thingy. I’m trying to avoid spammers. I’ll print off the emails, fold the sheets, toss in a bucket, and have my Resident Contest Winner Picker draw the winner…and post it on the website on August 1. Questions? Post them in a comment. If you already bought a copy of THE GRIMM LEGACY (first, let me say…THANK YOU!! ), and want to try to win a copy to give a friend as a gift…that’s okay. If you already bought a copy of THE GRIMM LEGACY and would rather win a sneak peek at book 2…which I’m currently writing…THAT’S COOL TOO! I was out at the Art Affair on the Square in Urbana, Ohio, this weekend…and held another drawing for a free ebook. Tari…I’ve dropped you an email to find out what format you need. If you haven’t gotten the email yet, drop me a message at addiejking@gmail.com and we’ll get it figured out. Do I even have to spell it out? 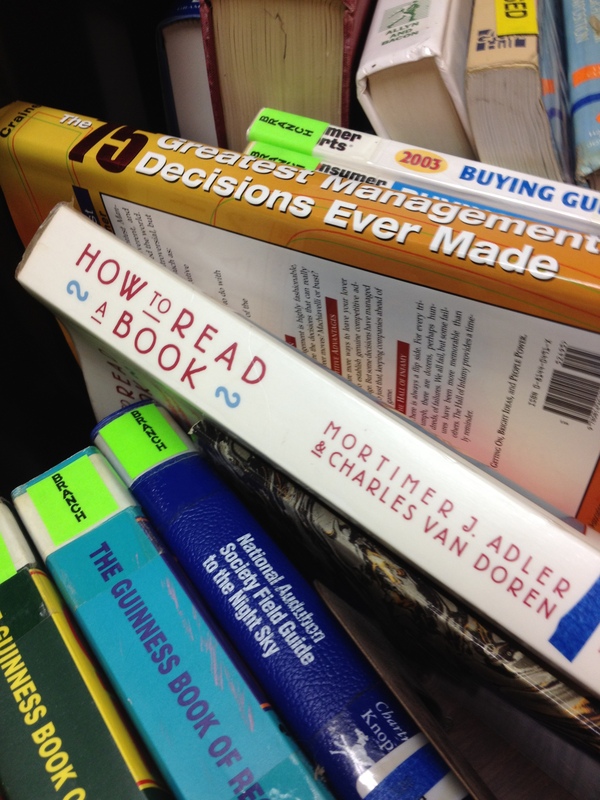 Reading a book on how to read a book….just makes no sense.